The lesson was very informative and eye-opening. 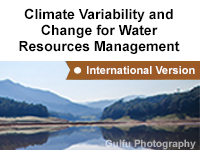 A great way to learn about climate change effects on water resources. it requires to be some more specific. Nice data about climate change. this's from best lesson that I've learned, provide the main impact of the globe warming and how the system determined the climate. it's so useful information to have about the climate. this is on the job training, as well as education for me, plus i can go back and test any subject again.